To find High Adventure Ranch, take Interstate 44 to St. James, MO, then south on Highway 68, approximately 16 miles to YY. Turn left and go approximately 5 miles to the gate on left. 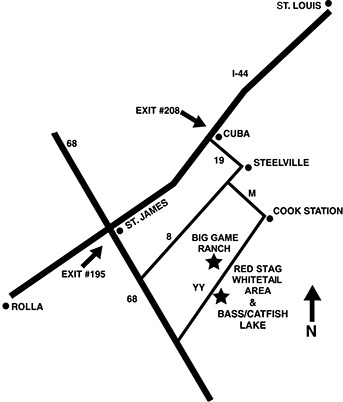 To find High Adventure Ranch, take Interstate 44 to Cuba, MO, then south 8 miles to Highway 19 to Steelville. Take Highway 8 west for 4 miles to Highway M. Turn left on M for approximately 12 miles to Cook Station, then west on YY for 2 1/4 miles. Gate is on the right.